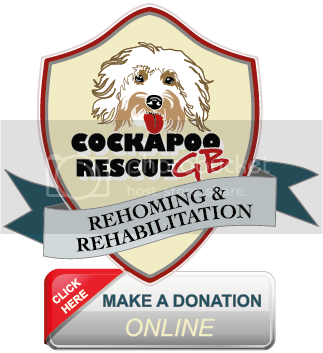 Team CCGB is made up of a team of volunteers, from a wide range of Cockapoo owners, breeders and enthusiasts (as well as other breed owners) to ensure the site content and the running of the club is objective and unbiased. What Cockapoos do you have? Bilbo Baggins born 16/11/2009 and Flicka born 21/04/2013, both Working Cocker x Miniature Poodle. What Cockapoos do you have? Wiggins DOB 22-05-13 Show Cocker x Miniature Poodle. Nibali (Nibby) DOB 07-06-14 Working Cocker x Miniature Poodle. Where are your Cockapoos from? Wiggins - hobby breeder. Nibby - Licensed Breeder. Where are your Cockapoos from? What Cockapoos do you have Yogi, born June 2011 - Working Cocker x Miniature Poodle. Woody III, Nike, Sox, Boo Boo..
What Cockapoos do you have? Ruby born September 2010. Daisy born August 2011. Both are Show Cocker x Miniature Poodle. Also now Dottie, Chi Chi and Wilson. What Cockapoos do you have? Max, born June 2011, Polly, born Oct 2012 both Working Cocker x Miniature Poodle, Sookie, born Sept 2015, Working Cocker x Miniature Poodle. What Cockapoos do you have? Poppy, born September 2009 and Rosie, born April 2011. We are always in need of active, helpful people, who are committed to helping our members and who are not afraid to join in our Team Discussions. Please contact us below if you are interested in joining Team CCGB. We will never forget our friends Helen and Heather, who both gave so much to the Club, and were just the most beautiful, kind hearted people. We were honoured to have you on board and we will always miss and love you.